How Does the Cochlear Implant Work ? an electrode array, which collects the impulses and sends them to different regions of the auditory nerve. It is important to note that a Cochlear implant does not restore normal hearing. Instead, it provides a deaf person a useful representation of sounds in the environment to help him or her understand them. The Bionic Ear can help young children who are to acquire speech, language and social skills. Most adults who have lost all or most of their hearing can also benefit from the Cochlear implants. The Cochlear implants are useful for those who have lost their hearing sensations later in life and cannot benefit from hearing aids. It can also be of immense aid to young children who are deaf. This implant helps them cope and also learn day to day speech and understanding of language. Some children with congenital hearing disorders may also need Cochlear implants. The implantation surgery lasts about 2-3 hours and is performed under general anesthesia. 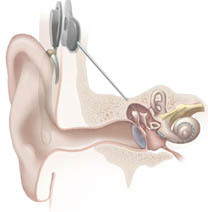 The electrode array is fitted into the cochlea while the receiver or stimulator is secured to the skull. The success of operation is tested by checking the functionality of the processor and taking an X-ray to ensure that the device is positioned correctly. Normally, a patient has to stay in the hospital for not more than 2 nights. The patients can resume work as soon as they feel well enough. This is usually within a week.